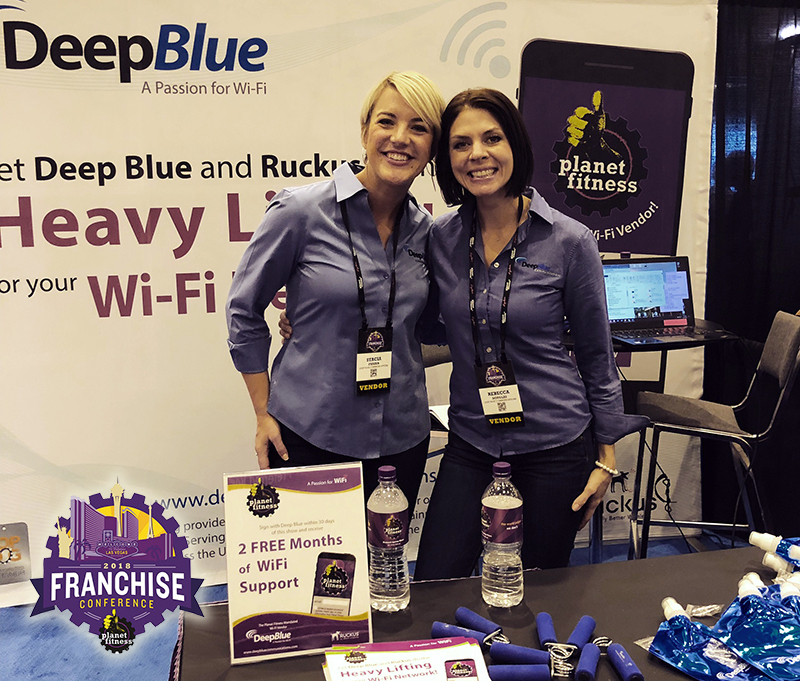 Las Vegas, NV, March 13, 2018 – Deep Blue Communications was recently a proud exhibitor at the Planet Fitness Franchise Conference. Senior Director of REV Rebecca Douglas and Account Manager Stacia Frazer met with Planet Fitness franchisee owners and managers to explain how Deep Blue is able to meet and exceed all their technical requirements. As the approved Planet Fitness WiFi vendor, Deep Blue provides managed Wi-Fi services for over 400 Planet Fitness locations. We support both the Connect Life Fitness Cardio equipment and corporate mandated Cerdent Sonicwall. Deep Blue has the distinction of being one of fastest and most efficient installers of WiFi networks and technology in the business. Our installation technicians arrive on time, ready to install networks, and can even provide expedited installation service when the timeline demands it. Deep Blue also offers ceiling mounted and pole mounted AP options. Our new pole mount solution offers the advantage of access points suspended by poles at ladder height for easier maintenance. Deep Blue also provides 24/7/365 guest support from its U.S. based WiFi help desk located in Latham NY. Your support number provides immediate contact with our support team, and a tiered support system enables quick escalation so issues are resolved quickly and efficiently. Contact Stacia Frazer today at (518) 389-2720 to get your quote on a Deep Blue Communications WiFi network for your Planet Fitness location.